TransFreeze Vol. 2 from Pixel Film Studios is a self animating masking transition. With TransFreeze users can reveal any object or subject with a unique freeze mask effect in FCPX. Each preset allows for various slant animations along with reversible animation directions. Users have full control over what is in the first foreground mask and what is later revealed in the background. Creating a dynamic freeze transition has never been easier. 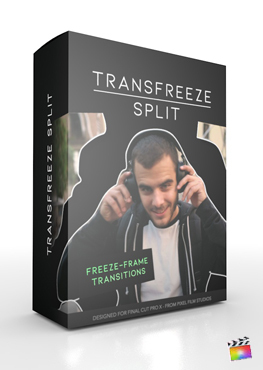 TransFreeze Volume 2 provides Final Cut Pro X users the means to create a unique freeze frame transition from one clip to the next. To use FLIP OUT presets, choose a video clip and hold the position of the frame you want to freeze with the hotkey “Shift + H”. Next, drag a TransFreeze preset into the FCPX timeline and align it to the frozen frame. Lastly, use the built-in masking tool to cut-out a section in your video footage and compound. To use FLIP IN presets, choose a video clip and freeze the first frame of the video using the hotkey “Shift + H”. Use the built-in masking tool to cut-out a section and compound the clips together. Place the compounded clip above a second video file to transition seamlessly. TransFreeze Volume 2 features intuitive customization options that are located in the top-right inspector window. With easy sliders, editors can control the angle of view and add depth of field to the transitioning scene. Additionally, users can alter animation direction of the cut-out and background with a simple anchor point control. Creating a dynamic freeze frame transition in Final Cut Pro X has never been easier. Where do I find TransFreeze Volume 2? Once the installation is complete, you can find TransFreeze Volume 2 in the FCPX Titles library. What version of FCPX do I need to run TransFreeze Volume 2? Final Cut Pro X version 10.2.1 or newer is required to run TransFreeze Volume 2. My TransFreeze plugin has missing Controls, did I miss something? If you are unable to locate TransFreeze in FCPX, or your TransFreeze seems to be missing controls, its most likely due to missing one of the Installation steps. Make sure both installers are ran correctly without any error messages, and that FCPX is restarted before use. Im not seeing my subject Cut-Out, only my full shot. Did I miss a step? Make sure you click back on the first mask point after setting the last mask point to close the mask shape. An indication of closing the mask shape if the mask points will change color and you will see your subject cut out and separated from the background.